(Nanowerk Spotlight) Graphene currently is the most studied material on the planet (What is graphene?) – this is especially true for charge storage and the results from many laboratories confirm its potential to change today’s energy-storage landscape. Specifically, graphene could present several new features for energy-storage devices, such as smaller capacitors, completely flexible and even rollable energy-storage devices, transparent batteries, and high-capacity and fast-charging devices. 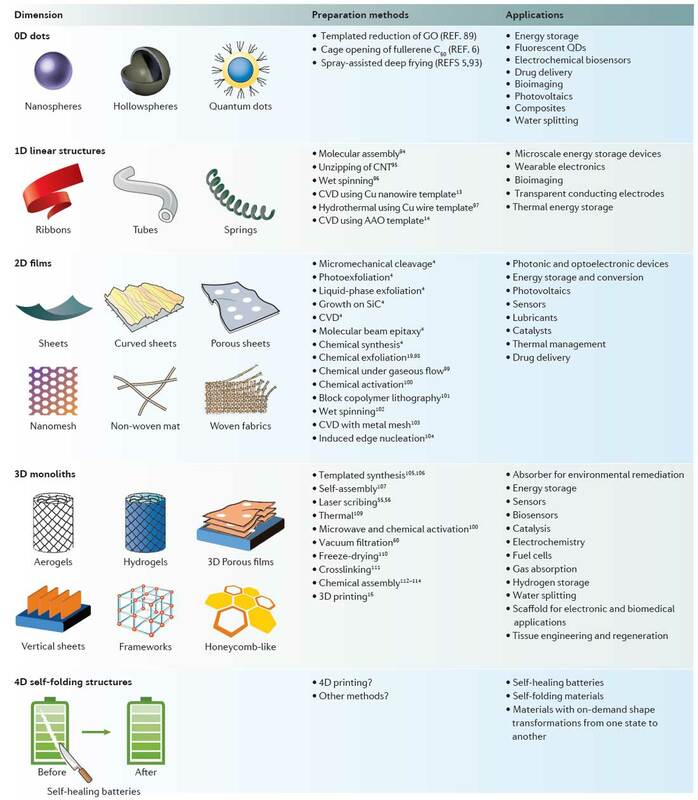 These and other features are explored in detail in a review article in Nature Reviews Materials ("Graphene for batteries, supercapacitors and beyond"). Despite notable progress, the future of graphene in the energy-storage market is uncertain because of several challenges. 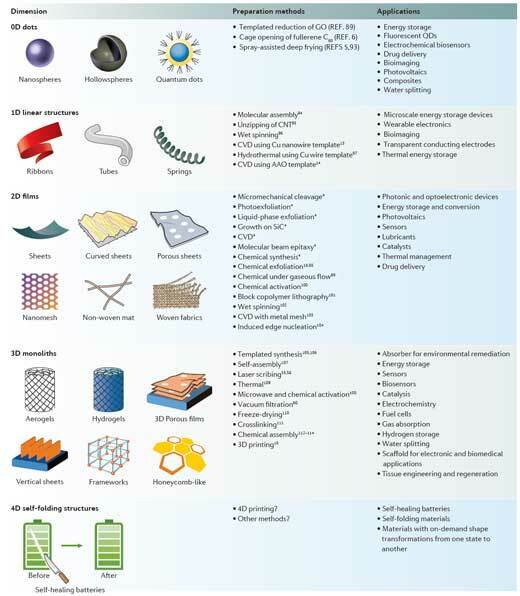 The authors discuss and propose solutions to these challenges and also briefly discuss the potential of other emerging 2D materials for energy-storage applications. In a previous Nanowerk Spotlight we already discussed graphene materials for energy storage applications. In particular, graphene has attracted great interest for supercapacitors because of its extraordinarily high surface area of up to 2,630 m2 g-1. "However" as the authors write, "to understand the limits of graphene in supercapacitors, it is important to know the energy density of a fully packaged cell and not just the capacitance of the active material. In addition to the capacitance of graphene, the maximum energy density of graphene-based supercapacitors depends on several other parameters, such as the thickness and density of the graphene film and other cell components, including the current collector and the separator, the nature and density of the electrolyte, the operating voltage window of the cell and the packaging efficiency." Graphene is also very useful in a wide range of batteries including redox flow, metal–air, lithium–sulfur and, more importantly, lithium-ion batteries. Graphene can be chemically processed into various forms suitable for both the positive and negative electrodes, enabling the fabrication of an all-graphene battery with an ultrahigh energy density. Researchers also have repeatedly shown the use of graphene composite materials, for instance carbon nanotube/graphene sandwiches, for high-rate lithium-sulfur batteries or to boost lithium metal batteries; or in combination with molybdenum disulfide as high-performance electrodes for sodium-ion batteries. Even 3D-printed graphene batteries, using graphene ink, have already been demonstrated. To realize the commercial potential of graphene, it is necessary to develop reliable, cost-effective and facile processes for the industry-scale fabrication of graphene electrodes with good performance. In a previous Nanowerk Spotlight we have discussed the worldwide patent landscape for the mass production of high quality graphene. Solution processing offers a simple yet effective strategy for the fabrication of graphene electrodes and is compatible with the current production protocols adopted by industry for the preparation of battery electrodes. Graphene dispersions can be processed into electrodes using various coating techniques, including : dip coating, rod coating, spray coating, inkjet printing, spin coating, screen printing, gravure printing, blade coating, electrospinning, electrodeposition, vacuum filtration, drop casting, interfacial deposition, Langmuir–Blodgett deposition and layer-by-layer assembly. The most appropriate coating technique depends on the desired properties and size of the final electrodes, and the desired film thickness and amount of graphene in the dispersion. Another important parameter is the design of the device – that is, whether a traditional sandwich structure or a planar energy storage device is needed. 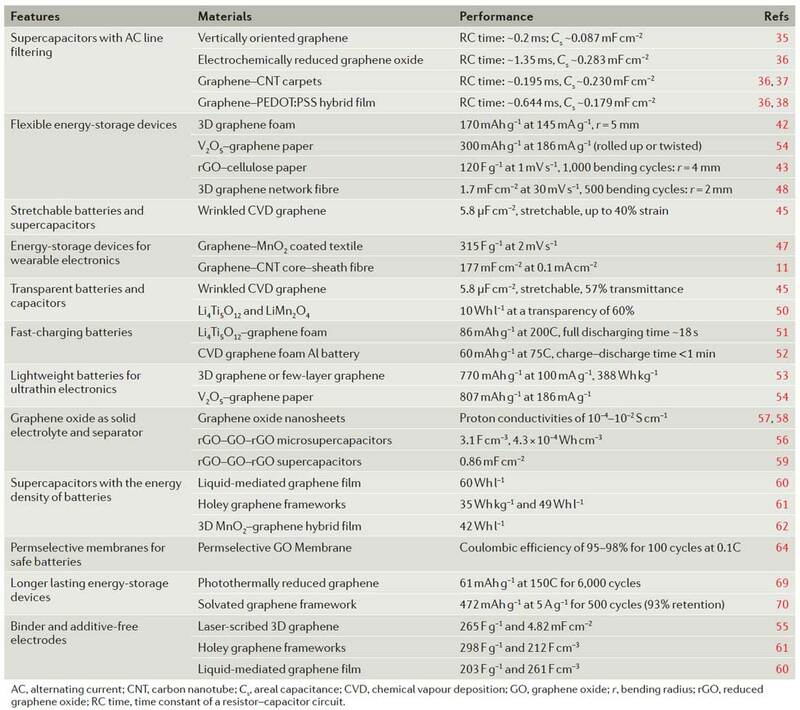 In this final section of the review the authors discuss the still many challenges to be addressed to realize the practical applications of graphene batteries and supercapacitors. Although researchers have demonstrated graphene-based batteries and supercapacitors with performance characteristics far exceeding those of commercially available ones, the lack of feasible techniques for the mass production of high-quality graphene limits their potential. Estimates for the cost of production of graphene vary depending on the quality of the material from tens to thousands of dollars per kilogram, but it is still not competitive with state-of-the-art materials. For example, the very low cost of activated carbon currently used in supercapacitors (US$15 per kilogram) presents a difficult barrier to the entry of other materials. 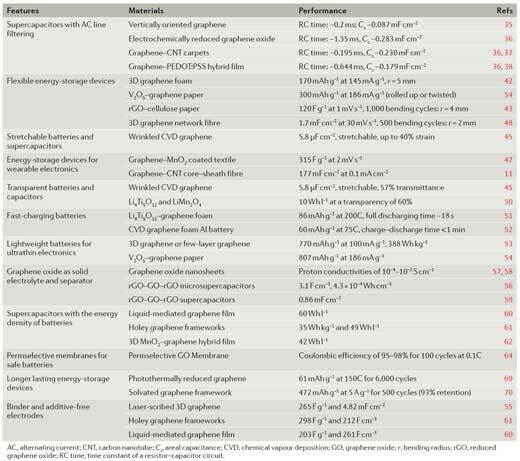 "There is no doubt that graphene has changed the landscape of energy storage because of its outstanding electrochemical properties and unique combination of large surface area, high electronic conductivity and excellent mechanical properties," the authors conclude their review. "However, the full potential of energy-storage devices built from graphene has yet to be realized. Many challenges remain, particularly with regard to feasible techniques for the low-cost mass production of graphene with controlled microstructure and low residual oxygen content." "More research efforts should be made for resolving the existing challenges using theoretical calculations together with experimental investigations. Further understanding of the interaction of graphene sheets at the nanoscale to form self-assembled structures of different shapes and dimensionalities will drive more potential applications for graphene. Graphene research is expected to continue to expand rapidly during the next decade with the promise that it will make a real impact on our lives."